I'm confused I have seen pictures in a video of Arie and Lauren in AZ. Can someone tell me when and where it took place which episode. 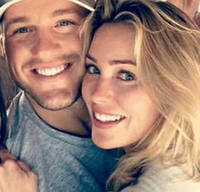 @Iluvbachette wrote: I'm confused I have seen pictures in a video of Arie and Lauren in AZ. Can someone tell me when and where it took place which episode. It's my understanding Arie and Lauren met up a few times in the 6 weeks prior to ATFR. The video and pictures may be from one of those meet-ups. That's a great picture of them!